We’ve done a few of these themed Banters this year – see Culture & Me and Nature & Me – so it was kind of fitting to do Christmas & Me as part of the Young Hearts Run Free Present Yule! extravaganza. 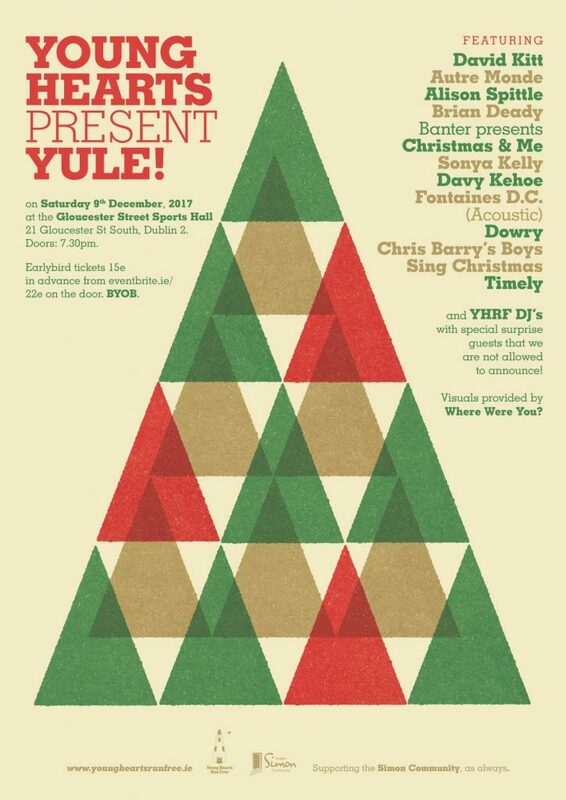 On the night, we will be joined by Brian Deady and Sonya Kelly to talk about what Christmas means to them. What are the Christmas traditions, rituals, songs, notions, records, TV shows, food and what-have-you which means Christmas to them? Aside from Christmas & Me, there’s a huge bill of fare on the night (see poster below). It all happens at the Gloucester Street Sports Hall (21 Gloucester Street South, Dublin 2 – off Townsend Street) on Saturday next, December 9. Doors open at 7pm and admission is €15 in advance or €22 on the door. All proceeds, as always, will support work of the Simon Community.